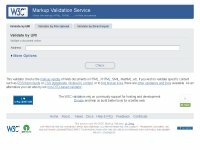 Description: W3C's easy-to-use markup validation service, based on SGML and XML parsers. 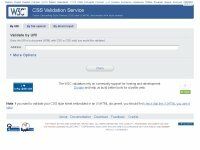 Description: Validate your CSS based on W3C standard. Description: Why No Padlock? - Why is my SSL web page insecure? Find the culprit! Description: Check browser compatibility. Cross platform browser test. Browsershots makes screenshots of your web design in different operating systems and browsers. It is a free open-source online web application providing developers a convenient way to test their website's browser compatibility in one place. When you submit your web address, it will be added to the job queue. A number of distributed computers will open your website in their browser. Then they will make screenshots and upload them to our central dedicated server for your review. Description: Serving Adult Webmasters since 1997. Our adult search engine directory features hundreds of adult webmaster categories from adult web design, billing providers, content providers and much more. Description: CloudFlare is a free global CDN and DNS provider that can speed up and protect any site online. Distribute your content around the world so it’s closer to your visitors (speeding up your site). Description: Accept payments online. 2Checkout.com is an online payment processing service that helps you accept credit cards, PayPal and debit cards.